Drive by a commercial property today and you are likely to see a large, monolithic obstruction impairing your view. It is not the garage for a blimp or the starship-Enterprise. It’s actually an aluminum backflow preventer enclosure for one of the building’s water lines. Until recently, a property owner could do nothing to avoid this hulkish monstrosity. But with the availability of new, smaller backflow preventer designs, greater knowledge of this system within the engineering community, and changing guidelines in local codes, there’s great news. Here are the three must-dos to keep this airplane hanger from your next project’s entrance. In recent years, the waterworks manufacturers have perfected a new assembly design known as the n-type assembly. This assembly is significantly smaller than the traditional models that fill our landscape today. In fact, making this change can reduce the size of enclosure by 70%! At the end of the day, when discounts are added and deals are tightened, the n-type assembly is unavoidably about 8% more expensive. A fair trade if you ask me, but let’s ignore what I think. The truth is that this solution is actually no more expensive. How, you ask? There is a subtlety in the way these pieces get ordered that makes it important to get involved with this item early. Backflow preventers are often part of the plumbing equipment bid requested by the plumbing contractor. Other times, it is in the hands of the utility contractor. For both of these subcontractors, the backflow preventer is an ancillary, single item that, in their minds, is buried in the dirt just like the pipes that come and go from it. To them, it makes no visual impact and as long as it works and has a competitive warranty, the cheapest one will do. When they turn in their equipment list to the supply house for a bid, the supply house is well aware of this. No supply house is willing to risk losing a bid by specifying a more expensive assembly than is necessary. So unless the n-type has been specified by the designer on the plan drawings, it simply will not be part of the bid. The sales rep for a large waterworks distributor in Texas recently guessed that of all the BPAs they ship in and around the state, about 2% are n-type. There is an important factor being muted here. Referring back to the previous comparison; check out the difference in size of the associated backflow preventer enclosures. Being much smaller, the price of the n-type enclosure is less. Much less. In fact, in most cases, it is more than enough to offset the cost of the more expensive assembly. So even though the property owner is getting a higher preference, which in the hallowed halls of economic theory means it is worth more, the solution is often less expensive. The form factor of this new n-type assembly is vertical rather than horizontal. In fact, the incoming and outgoing pipes are fed from beneath the assembly. Any spool pieces or other added components would add to the height of the enclosure. It is easy to see how adding pipe sections and strainers to this “stack” would turn this into a tower, which is no better than, and maybe worse than, the coffin required for the in-line assembly. Many engineers add a wye strainer as a matter of perfunctory habit. 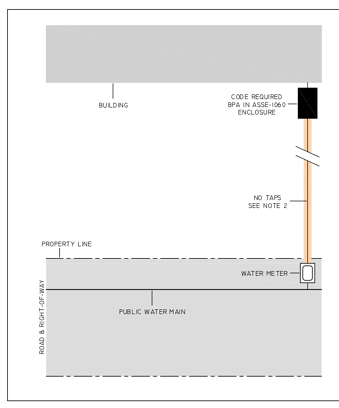 Moreover, many cities cling to a wye strainer recommendation that is often unnecessary. Today, most water meters have a strainer built into them and since the meter is immediately upstream from the backflow assembly, an additional strainer is redundant and acts only to diminish delivery pressure. If your water district recommends or even requires a strainer on the device, its worthwhile to challenge it by determining how long that requirement has been in place and whether the meter has a built in strainer. If so, you are likely to get the requirement dropped. Size is just one of the five major considerations of industrial enclosure design. Learn all five here. It is the habit of most civil plans review personnel, as well as civil engineers that lay out utility services, to place the water tap for new service as close as possible to the property’s planned driveway location. But now, with an above ground backflow preventer enclosure to install, it’s much more sensible to consider the impact to the visual field and strategically place the water tap accordingly. Several jurisdictions have been using aboveground enclosures long enough that the plans review folks are already thinking about the enclosure’s impact at the beginning. 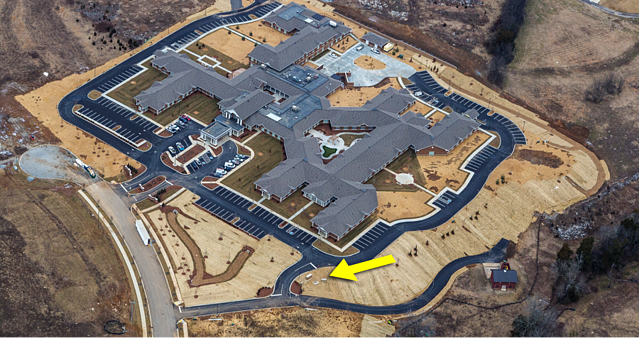 Here’s a picture of a recently constructed medical facility in the Nashville, Tennessee area. Most jurisdictions would have tapped the water line at the driveway. But because the review team is experienced with these enclosures and their propensity to interrupt the visual field, they discussed this with the site engineers and recommended the location identified by the yellow arrow. Most utility site plan review folks tell me that it is not that they cannot relocate the tap along the property’s width, it’s that they’re never asked to. Seek to place the backflow assembly as close to the building as the water utility will allow. While it is true that AWWA best practices call for the devices to be placed as close to the water meter as possible, some cities are beginning to test that wisdom in the interest of aesthetics. Several contiguous water districts in the Dallas-Fort Worth area of Texas have recently published details that allow backflow preventers for domestic lines to be near the building rather than at the property’s edge. This is to diminish their visual impact and to facilitate engulfment of the enclosure into the building’s perimeter landscaping. They still show both methods as allowable, as you can see in the images below. This is too obvious, but a constant surprise to me. Few designers seem to realize that enclosures are available in many colors. As far as I know, all manufacturers charge more for a color – other than silver – except Safe-T-Cover. We ship our standard models in our four most popular colors at no additional charge. My personal favorite is Hartford Green, shown here. 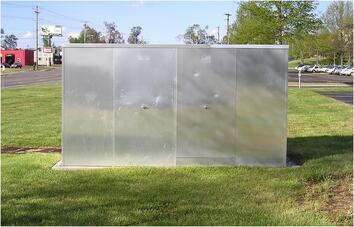 Always integrate landscape screening around the enclosures, no matter their size. This is the most important remedy for overly-prominent enclosure placement, and yet the most widely committed sin. In fact, it is fair to say that once an enclosure is in place, this is the only thing that can be done to diminish its “presence” and yet, so few property owners bother. 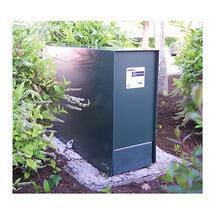 It's easier than ever to keep industrial enclosures out of sight on new projects. 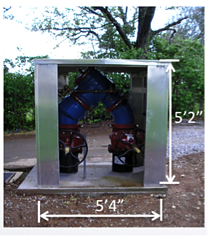 We've written more on this topic with visual examples on our backflow enclosure aesthetics page. For now, remember that choosing an n-type backflow assembly, specifying the least prominent location, and camouflaging the enclosure with landscaping and custom colors are the three best ways to reduce their visual impact. All it takes is a few more details specified than most engineers are used to. Even choosing just one of these methods will work wonders for your design.